Good Friday in India | Walk with us! For Good Friday six of our brothers plus, John our cook and his wife Rahka, came with me for the Stations and liturgy. The other four brothers opted to go to the cathedral in Eluru for their Good Friday prayers and devotions. Since tonight’s Holy Saturday vigil begins late (10:00 pm) we’ll all be going over to the Holy Family Brothers house. I was the celebrant at the Good Friday service so Fr. Gustavo, a Spaniard, will be tonight’s principal celebrant. Things were rather quiet around our house as the brothers observed Good Friday; a number of them fasted, skipping both breakfast and lunch. Our supper (following the Good Friday service) was their Friday penitential meal, as I like to call it. It’s a dish of watery rice and curd. I opted for a repeat of breakfast, i.e., peanut butter augmented with mayonnaise. 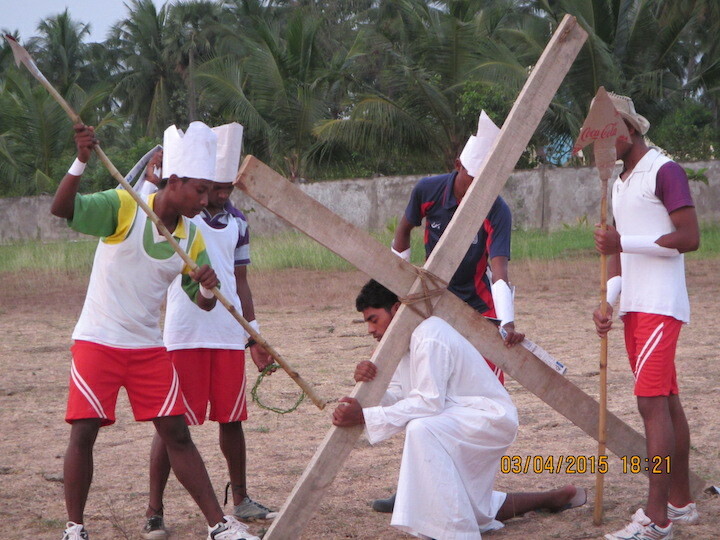 The brothers’ high school students did a pretty good job of giving a dramatic presentation of The Way of the Cross. It took us about 45 minutes to make our way around their athletic field finally ending up near the entrance to the chapel as we laid Jesus in the tomb. Our own SCJ brothers spent most of the week working outside so it was suggested this morning that work be devoted to cleaning the house for Easter. I thought it a good idea and off the brothers went to work, including cleaning my room. I escaped to the small community room on the second floor with my iPad to continue reading. Shortly after settling in for a good read Br. Martin, SCJ, came to say that the Holy Family Brothers were downstairs. 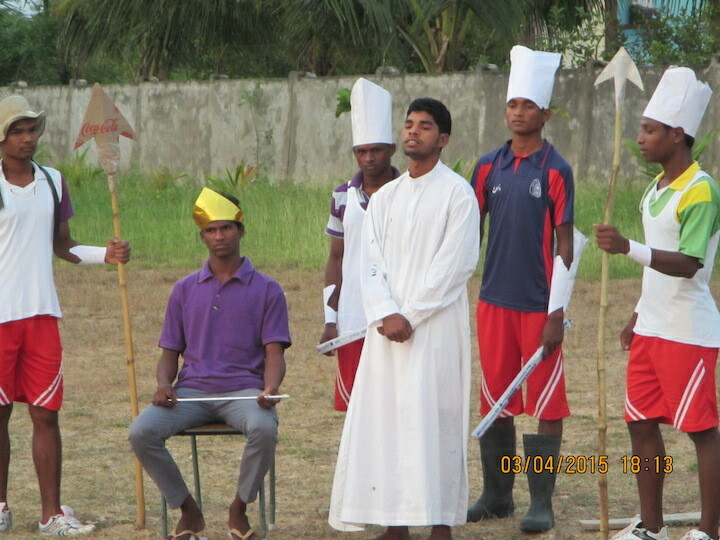 Indeed their entire community of high school students, aspirants, postulants, novices, and professed brothers were on their annual Holy Saturday pilgrimage. Since we are the closest house to them we were their first stop as they began to pray the rosary. From here they will visit a number of other religious houses on their pilgrim’s journey. For now the rest of our day will be spent quietly waiting for this evenings Holy Saturday Vigil to begin.